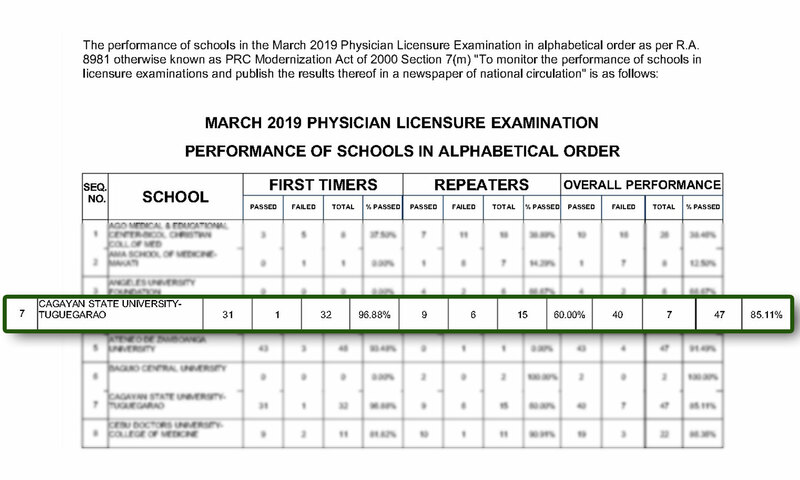 CSU College of Medicine has recorded an 85.11 percent passing rate in this monthâ€™s licensure examination for physicians, a figure that is above the 76.47 national percentage. The website of the Professional Regulation Commission (PRC) reported today that CSU produced 40 new medical doctors out of 47 who took the examination. The 40 new physicians are part of the 1,209 passers who registered an overall national passing rate of 76.47 percent (1,579 total takers). A further look at the figures reported by PRC shows that CSU got a 96.88 percent (31/32) passing rate for first-timers, while the school scored a passing rate of 60 percent (9/15) for repeaters. The official list of successful examinees from CSU to be released by the College of Medicine will be posted here as soon as the information is available. In the meantime, you may read the list of successful examinees supplied by PRC through this link https://www.prc.gov.ph/sitâ€¦/default/files/PHYS0319-alpha.pdf .